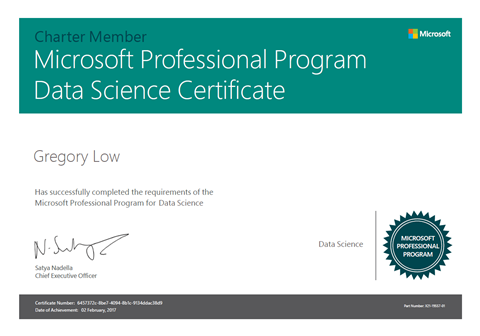 In the second half of 2016, I enrolled in the Microsoft Professional Program for Data Science, and completed it in early 2017. I have to say that I really enjoyed it overall. It was a bit challenging at times but I don't regret doing it. If you want to get the certification, you need to enroll in the verified option for each course. Nowadays, that's pretty much $99 USD per course. You can do it for free, and if you're tight on funds, perhaps that's what you should do. I like to support the concept, and like to support both Microsoft and edX for creating these options. They are doing amazing work, so while I hear people say to just do the courses and not contribute to them, I can't say that I agree. edX and their partners offer an incredible range of world-class courses that you can take for free, but if you want them to continue, you should consider contributing. And that applies to the non-Microsoft ones too. I think that programs like these are more likely to be the real future for Microsoft certification in general. 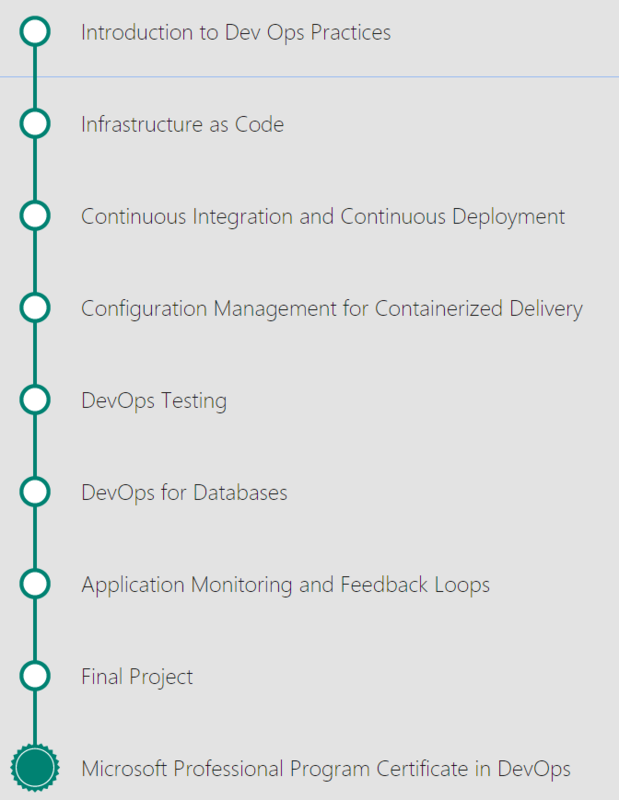 Earlier this year, Microsoft created a Professional Program for DevOps. I've had an interest in DevOps for a long time, and I got the opportunity to help create one of the courses DevOps for Databases with the inimitable Steve Jones from Redgate Software. Databases are a specifically-challenging area for DevOps. A few months back I decided to start pursuing this professional program as well. I've got one course to go (the container one) before the final capstone project. I can finish that container course in the next three months, but unfortunately the capstone project won't be available until April. Over the last few weeks, I've been involved in enhancing the existing Monitoring and Testing courses, and am looking forward to seeing how people find the updated versions. To support my continuing interest in DevOps, in the upcoming weeks, you'll see DevOps-related posts from me.